We are now well into the late-heading and early-flowering growth stages, and understandably, folks are concerned about head scab and vomitoxin. Questions keep coming in about applying fungicides for scab control, particularly when and whether a fungicide is needed. The forecasting system (http://www.wheatscab.psu.edu/) shows that if your wheat flowered over the holiday weekend (May 22- May 25) or is flowering today (May 26), and your variety is moderately susceptible or moderately resistant, the risk for scab is low. Low risk usually means that a fungicide treatment is not warranted. This low-risk forecast is probably due to the fact that it has been relatively dry over the last week or so. Although temperatures have been in the favorable range for head scab development, we have had little rain since May 17. Dry conditions combined with moderate cultivar resistance help to keep the risk of scab down. However, flowering will continue across central and northern Ohio over the next 7 days, so continue to keep your eyes on the weather and the forecasting system to see if the risk for scab increases as your crop begins to flower. A fungicide application could be needed if conditions become favorable. 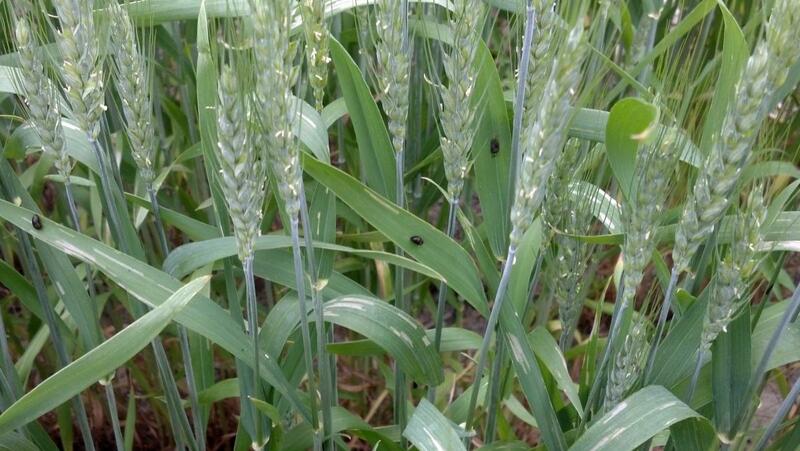 Questions are also being asked about cereal leaf beetle, as the numbers have increased over the past week. The larvae are the most damaging stage and can cause leaf stripping (already seen in some fields) from their feeding. They are small, dark and moist and closely resemble bird droppings. But don’t be fooled, these larvae can do heavy damage to a field, causing substantial yield reduction, particularly if the flag leaves are badly damaged before grain-fill is complete. To determine if a spray is needed, randomly inspect 50 stems in your field. If the average number of larvae is greater than 1 or 2 per stem, you may want to consider treatment. 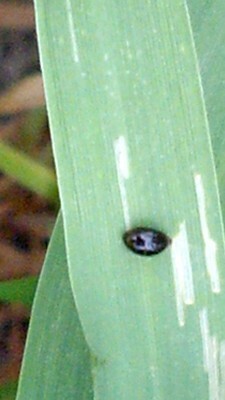 Several products are available for both scab and cereal leaf beetle control (see Bulletin 545 for a list of insecticides:http://oardc.osu.edu/ag/images/545_Final_2013(3).pdf ). Tank mixing is an option if your field has both scab and cereal leaf beetle—please review pesticide labels before any application and make sure your products are compatible.